Virustotal statistics indicate this downloader is still in use, although the server of the sample I have analyzed isn't available anymore (more samples see Appendix). The decrypted strings of this sample can be found at the Appendix. It should be noted that some encrypted strings never get decrypted (artifacts, highlighted in Appendix). For persistency this malware copies itself into system folder as "sescmgr.exe", alters its creation date to "17.8.2004 19:22:00" and adds a registry key into HKEY_LOCAL_MACHINE\Software\Microsoft\Windows\CurrentVersion\Run ("sctrlmgr"). It also adds the TLD "realsearch.cc" into the list of Internet Explorer's trusted websites (HKEY_CURRENT_USER\Software\Microsoft\Windows\CurrentVersion\Internet Settings\ZoneMap\Domains). To circumvent the Windows firewall it adds itself as "QoS SRVSP" into the trusted applications list (SYSTEM\CurrentControlSet\Services\SharedAccess\Parameters\FirewallPolicy\StandardProfile\AuthorizedApplications\List), but only if it was executed on Windows 2000/XP/Server 2003. 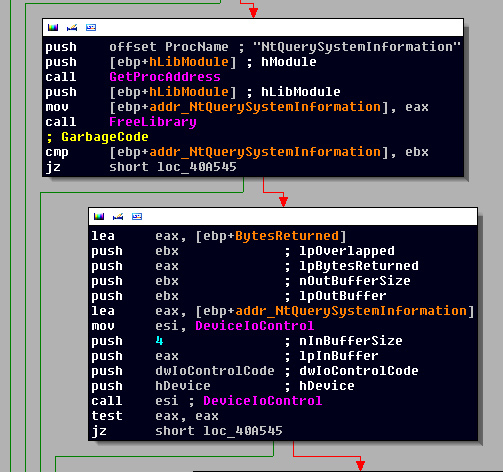 As you can see the malware uses pretty standard techniques for its own setup. After this, the kernel driver gets copied from resource section into the Windows driver folder as "vissv.sys", again only if it was executed on Windows 2000/XP/Server 2003. Then, the file creation time is also changed to the same as above. There follows the driver persistency setup and loading by first creating a Windows service named "VISSV" (OpenSCManagerA + CreateServiceA) and then starting it (OpenServiceA + StartServiceA). After the driver was loaded by the Service Control Manager, the usermode component communicates with it by using DeviceIoControl API function. It first sends the control code "900h" along with the address of the exported function NtQuerySystemInformation from ntdll.dll (lpInBuffer). If successful, it sends control code "A00h" along with the PID of itself. And last but not least, if successful it sends control code "1800h" along with an empty buffer. In the next Chapter we will see to what operations the control codes lead in the driver. Next, a new Thread is created which handles the downloading and execution of the files. Since these files aren't available anymore, I mainly skipped this part of the malware. But if you want to get a general feeling of the downloading part, it's enough to take a look at the (decrypted) strings (in the Appendix). Check if NtQuerySysteminformation is already hooked by reading the first byte at address of NtQuerySystemInformation and comparing it to 0xB8. If it isn't hooked, save the next byte for later use (here 0xAD), which is the ordinal of NtQuerySystemInformation in the SSDT. Save the PID for later use. Hook the function NtQuerySystemInformation in SSDT by taking the ordinal saved before (0xAD) and changing the address to a handler inside the driver. The handler hides the process output by using the PID. Unhook the function NtQuerySystemInformation. Note: this routine never gets used (artifact), because this control code is never called. Curious! stack trace (and is typically the current instruction pointer). Arg1: 80501f34, Virtual address for the attempted write. "Considerations: On certain versions of Windows XP, the SSDT is marked as read-only. This must be taken into account when attempting to write to the SSDT across multiple versions of Windows." That's exactly the problem of the driver, it doesn't check if the SSDT is marked as read-only, thus it risks to cause a BSOD (or endless booting, like on my system). That's all! Thanks to TouchMyMalware for collaboration on reversing!